Come back November 1st at 11 a.m. ET to enter our Check-Out Hunger contest! Help us Check-Out Hunger and you could WIN! It's the season of giving! Join us as we partner with the Community FoodBank of New Jersey to provide food, help & hope to local communities this holiday season! 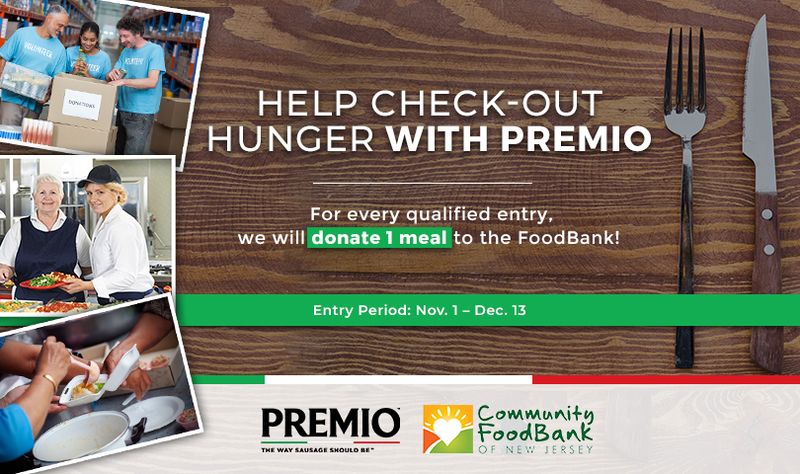 For every qualified entry, Premio will donate one meal or an equivalent dollar amount to the FoodBank up to $5,000. As a "thank you" for helping us check-out hunger, we will randomly select one winner each week to receive a Premio Swag Pack with free product coupons. At the end of the donation period, we will randomly select one Grand Prize winner to receive a Premio Swag Pack and a $500 AMEX gift card! Maximum 5 entries per person. The contest will run through December 13, 2018. This promotion is in no way sponsored, endorsed or administered by, or associated with, Facebook. You are providing your information to Premio Foods and not to Facebook. The information provided will only be used for donation tracking purposes and contacting winners. Thank you for helping us check-out hunger! You may enter up to four more times. The grand prize winner will be selected by December 18. Feel free to share this contest with your friends & family!